If you want to be ready for anything—from lifting cars off babies to scoring the winning goal—you need to be a better strength and conditioning athlete. Whether you already have a tried-and-true strength and conditioning routine, or you’d like to shake out of a workout rut, we’ve worked with certified fitness professionals Joe Scali and Sharan Dhaliwal of Semiahmoo Athletic Club to create a 7 day Vega Sport Strength and Conditioning Plan. *Consult your health care provider before starting any exercise regimen. • Even the most macho shouldn’t skip out on recovery time. This 7 Day Strength and Conditioning Plan is designed to be uploaded onto your phone or tablet, or if you love the feeling of holding an actual plan, printed (on recycled paper of course). Rather than create a 20 page PDF, this blog post will help you get started with the plan. If you’re newer to strength or conditioning workouts, we’ve also broken down the included exercises into step-by-step instructions. And finish strong with Vega Sport® Premium Protein. Have a question that’s not answered? Leave a comment below! Getting Started: What Weight Should I Lift? As you start to get familiar with this training plan, you’ll notice that each Strength and Conditioning workout has 5 rounds of 5 reps for each set of exercises. In the fitness industry that is called 5×5 and it’s one of the most popular muscle strength building approaches out there–if 5×5 were a senior in a class of workouts, it would be crowned Homecoming King AND Most Likely to Succeed. This 5×5 workout was designed to target all major muscle groups to promote muscle growth and full-body strength. It also incorporates periodization so you don’t hit a plateau, while giving your sufficient recovery time between training. Whether you print out the training plan or you view it on your smartphone, you’ll notice there’s no weight specified per workout anywhere in the plan. That’s because choosing the weight is crucial—and personal to you and your current fitness. To find the right weight, you should select a weight that you can do for a total of 5 sets with 5 reps, without over-exerting yourself. If you’re not sure how much weight you can safely lift, check in with a certified personal trainer for advice. During the first week of this program you should err on the side of caution to make sure your body has a chance to get used to this type of training. Your first week’s weights should feel light and easily manageable. Do 5 sets of 5 reps for each exercise block. If you have successful managed the weight of week 1 for all exercises, ramp up the weight by 5 to 10lb Because you’re increasing your weight, do 5 sets of only 4 reps. If you have successful managed the weight of week 2 for all exercises, ramp up the weight by 5 to 10lb again. Do 5 sets of 3 reps.
By the time you hit week 4, you’ll (hopefully!) be setting new 1 Rep Maxes, and seeing a significant increase in strength. This time, warm up with a few light sets, slightly lower than what you started week 1 with. Then add 5 to 10lb and do 5 reps. Adding 5 to 10lb each round, do 4 reps, then 3 reps, then 2 reps. Now, add the heaviest weight you can lift with excellent form, and do 1 final repetition. If you still feel like you have more fuel in the tank after that 1 rep, add a little more weight and try for another 1 Rep Max. Document the weight of your 1 Rep Max and the date. Repeat the cycle, knowing what your 1 Rep Max is now. Since you are building to a 1 Rep Max 5 to 10lb heavier than what you achieved in Week 4, Week 5 through 8 will be about building to that new 1 Rep Max. Work backwards from the new 1 Rep Max you are striving for, to find the weight you’ll start with in week 5. Repeat the 4-week cycle and continue to get stronger. 1 minute rest between rounds. 5 minutes max effort burpees. Set the timer and go! What is your favorite Strength and Conditioning day? The Vega Sport® Nutrition System will help you dial in every stage, from pre-, to mid-, to post-workout. Chase your next personal best with premium ingredients curated to help you fuel, replenish, and recover. Owner and Certified Trainer Semiahmoo Athletic Club Joe Scali grew up playing hockey and continued to play College Hockey at Cornell University and went on to play professionally in Texas. With his elite background in competitive sports and his passion for training, Joe pursued a career in the fitness industry. Becoming a personal trainer, he enjoyed helping people change their lives through fitness. His passion for training and vast experience in the fitness industry led Joe to open Semiahmoo Athletic Club. 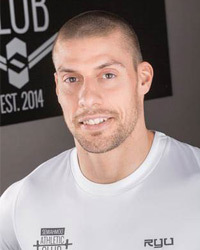 Joe is a CFP Certified Personal Trainer, CrossFit Level 1 Trainer, TRX Certified Trainer, and Certified in Trigger Point Performance Therapy and Twist Conditioning. Owner and Certified Trainer Semiahmoo Athletic Club Inspired by her entrepreneurial parents, Sharan Dhaliwal pursued a degree in business and entrepreneurship. Upon graduating, she pursued a career in the Natural Supplements Industry and continued her studies by obtaining her Advanced Sports & Nutritional Advisor Certification. Sharan is a CrossFit Level 1 Trainer.